Why Choose Bane-Clene® Carpet Cleaning Equipment? The Bane-Clene Carpet Care System is a tested, proven and unique carpet cleaning system, which will safely freshen and clean your carpets. Bane-Clene is a HWE (hot water extraction) electric-powered carpet cleaning system which uses no abrasive brushes or harsh chemicals. Pressures, temperatures and the pH of the cleaning agent are all carefully controlled. Bane-Clene leaves carpets soft, the texture restored, the colors brightened and better able to withstand future soiling. More than 95% of the moisture from cleaning is recovered with the Bane-Clene System. Carpets dry quickly, stay cleaner and last longer. Problems such as rust stains, pet odors and spots, heavy traffic lane soil, and shampoo or powdery residue from previous cleanings can be treated with our uniquely formulated cleaning agents and superior equipment. With Bane-Clene, all the heavy equipment stays in the truck - nothing enters your home or office but the operator, with a cleaning head and a long hose. We bring our own pre-softened, specially treated water and do not use your water or disposal facilities. All the dirty water and unpleasant odor goes out through the sealed hose into the waste water tank in the cleaning van. There is no messy clean-up afterwards and no danger of spillage in your home or office. Bane-Clene truckmounted equipment uses safe, efficient electric power. Nearly every other manufacturer uses natural gas, propane gas, gasoline or fuel oil for power - all of which can be dangerous for carbon monoxide poisoning and fire hazards. Bane-Clene truck-mount carpet cleaning equipment may be operated in a closed building without the danger of carbon monoxide poisoning. In the case of high-rise apartments, offices and condominiums, most Bane-Clene Carpet Cleaning Machines are capable of portable operation without sacrificing their high quality. The deep, HWE will provide the optimum in appearance for your fine carpeting and or upholstery. Bane-Clene has worked with fiber producers and carpet mills in testing their products, and Bane-Clene constantly updates training programs to include instruction in the cleaning of all new carpet materials. Technical data, updates and training videos keep Bane-Clene affiliates informed of changes in cleaning technology. 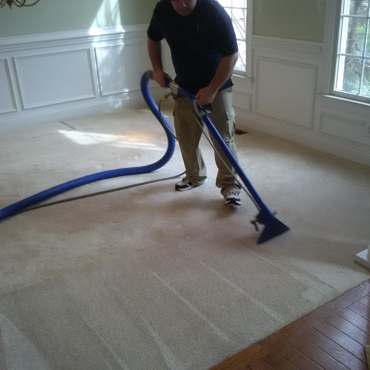 Major carpet manufacturers recommend that carpets be professionally cleaned and leading fiber producers and carpet mills recommend the safe, efficient and dependable Bane-Clene® System. The Truckmount Bane-Clene equipment and Bane-Clene branded chemicals are proudly “Made in the USA”! You’ve seen ads that compare the features and benefits of carpet cleaning equipment and chemicals! There are over 1,000 equipment and chemical suppliers serving the cleaning industry. There are at least 10 claiming to be #1. Why Bane-Clene® Over All Other Portables? Why Bane-Clene Over All Other Truck-mounts?